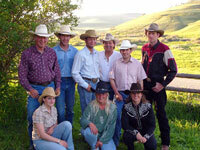 We had a great group of 6 young fellows (most were retired) from Ontario for our cattle drive in July. Also 2 young ladies, one from Ontario and one from the UK. This group created a special bond between each of them and our family as well. It was difficult to say goodbye. It was a wonderful week for all concerned. Later in July, we enjoyed more Ontario guests including one young lady who jumped right into learning about the farrier end of the horse operation... I guess you wold call this a learning holiday! Unique method of 'Getting the Horses' Ears Up for a picture!! 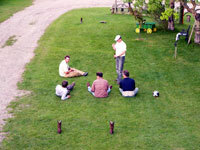 Our Wildflower Weekend (held the long weekend in May, 2007) was a great success. The group hiked both the Whaleback and Lucasia Ranch itself - finding many interesting species of flowers. Watch for next year's dates. 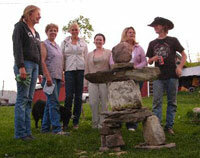 Lucasia Ranch can now boast of its own original Inukshuk, thanks to the instigation and imagination of recent guest Karen Allen and her son Zack Only through team work and a great set of guests from Calgary, (Karen and Zack) Scotland (Esther), England (Claire) and Germany (Eva) could we have accomplished our own "Lucasia Inukshuk"
Karen's knowledge and stories prompted us to attempt this unique piece of art. We think it looks great! The computer tells us that the Inukshuk are a symbol of the human spirit. They recognize our ability to succeed with others, where alone we would fail. "MAY THE INUKSHUK BE YOUR GUIDE FOR A SAFE JOURNEY THROUGHOUT TRAVELS. LET IT ALWAYS GUIDE YOU HOME." 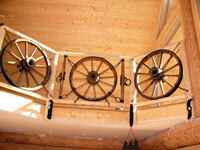 Spring is certainly here in the Porcupine Hills - we've had a mixture of snow, rain and yes... some sunshine. We've been busy at the ranch - renovating the kitchen/dining/office area in the main house... as you can see by the pictures below. Things are just about finished and we're expecting our first guest tomorrow. 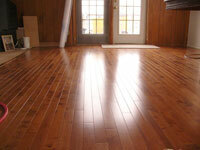 (See finished main house kitchen renovation.) 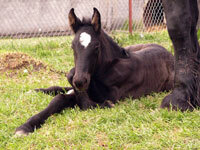 Spring also means new growth and babies... we've enjoyed several new Percheron foals over the last few weeks. Winter at Lucasia... 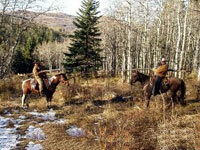 The ranch is crisp and frosty now and we have between 8 and 10 inches of snow. It really is beautiful with the trees coated with snow and the land a blanket of white. But ... the temperature has been hovering between 15 and 20 below celcius, so we anxiously await a forthcoming chinook. Wayne and I were fortunate to head to the southern states in search of warmer weather but as luck would have it, we found cooler weather in Arizona and our trip home grew colder the further north we came. As you can see, we did enjoy the gorgeous country and the fellowship of the great friends who call themselves "Snowbirds". This is to prove that we really did take a holiday. Our newest additions are 8 little mini-aussie puppies that arrived on the 23rd of December and are now looking for new homes. (Just call if you are interested). Our granddaugthers, Reegan and Amanda enjoy a playful day with them. We (Wayne and Judy) would like to extend our thanks to those who provided the help with our new cabin. 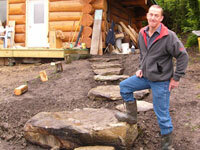 Our builder, Bob Warren built the cabin and set it up at the ranch in just 5 hours. 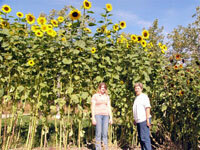 Bob and his daughter Rosie first came as Lucasia Ranch guests and look what we have now. Rosie is an annual guest and is now known affectionately as 'Trail Boss'. 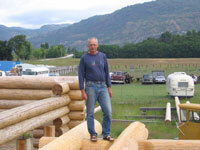 Her Dad, Bob, is an expert log home builder as our cabin attests. Bear Cat, (sounds like someone to recon with) arrived 2 years ago when we set out to restore our 1930's log cabin. Bear Cat has worked with logs for some time and we're pleased with what he as accomplished in our cabin - Thanks Bear Cat. Our next special thanks goes to Claudia Nehring and her father Henning. 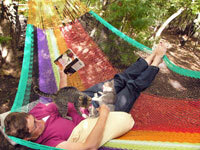 Claudia has been a frequent guest at the ranch over the last 3 years. She and her sister Angelica just happened to be here when our cabin arrived last summer. 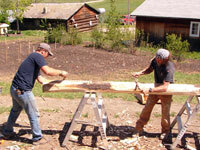 They pitched in like troupers and soon had jobs working on the logs. Claudia promised that she would bring her Dad and help us finish our cabin- she is not one to go back on her word and on the 23rd of May, Claudia and Henning arrived from Germany. 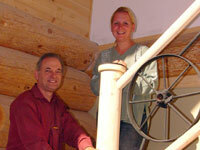 They spent 10 very hard days working on the railing in the cabin. We never perchased a thing for them, Henning could be seen going through our yard and pulling out special pieces that he thought he could use. We are very proud to say that our railing is one that no one else will have, made from the history of our ranch and the Lucas family, it shows off the wonderfull talent of our friends, Claudia and Henning. Thank you for coming from Germany to do this special favor for us. The middle photo shows some of the custom touches on the loft railing in our new guest cabin... courtesy of Henning & Claudia Nehring. 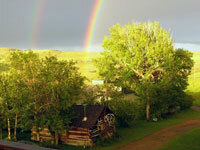 With the spring storms, also came some picturesque moments - like this double rainbow over our restored 1930's Lucasia Ranch cabin. We are very fortunate that our business has given us such wonderful friendships. Can't you tell it's spring? Babies everywhere! 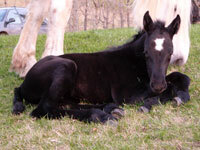 This little percheron foal enjoys a grassy resting place while Mom stands guard. When this photo was taken, there were three sets of goslings waddling around the ranch yard and trying their webbed feet in the pond. 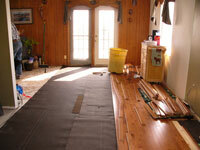 For those of you following the progress on our new guest cabin... we're in the final stages. 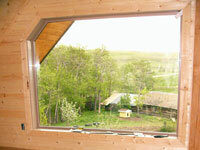 This is a view from the unfinished window of the loft. You just never know what you'll see in Alberta's Porcupine Hills... Cowboy Jousting anyone??!! 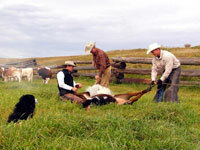 This year at Lucasia Ranch, our longhorns weren't branded until fall due to wet weather through much of the summer. Cowboy Country TV, an affiliate of Cowboy Country Magazine, spent the day filming the event for their 2006 13 part television Western Lifestyles series. I call this my bug patrol. 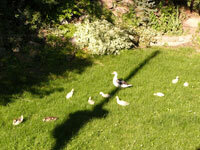 It's so much fun to watch these ducklings grow. And mother is like a watch dog - so don't get too close! 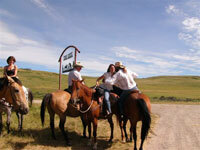 At Lucasia Ranch we are fortunate to get such wonderful guests from all over the world. Here we have some of the best from Belgum, France, Germany and Canada. Sometimes while moving cattle, we need to stop and doctor certain animals; the cowboys have to be fast on the draw to catch cattle in the open. And of course it's helpful to have good neighbours that we can call on. It was an exciting day in July when the cabin logs finally came by truck from the neighbouring province of British Columbia. 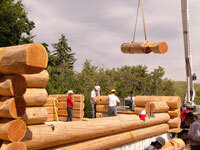 The logs were numbered and removed from the truck by crane. Our crew then put together the logs like a puzzle. Even our guests pitched in and our cabin was erected in record time. It took 5 hours to complete the cabin as you see it. It looks like it stands a long way in the air but the setting is private and attractive with trees around the back and two sides. We'll bring you more up to date pictures as we progress. Check out our Dutch guests who are trying to teach the Lucas boys a new game??!! Well, things are certainly green around the ranch... due mainly to the large volume of rain received over the past week - so much in fact, that Lyndon Creek, which runs through the valley in front of the ranch, overflowed its banks. 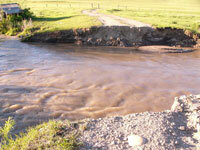 Culverts were washed out and water ran where it normally doesn't! 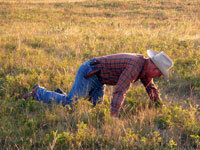 The image to the right shows the spot where the road across to our branding corrals used to be! 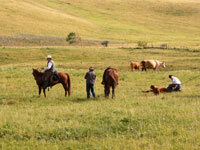 The moisture is very welcome but has caused a delay in the local branding/building schedule. Lucasia Ranch's new log cabin is progressing nicely... see latest pics (taken by Bob Warren, our log builder - and sometimes Lucasia Ranch guest - in British Columbia). The cabin site at the ranch is nearly ready for the logs... as soon as the area dries out a little more, the floor can be poured and the logs trucked in... we'll keep you posted! One other bit of news that's pretty exciting... the Internationally renowned Television Series The Thirsty Traveller stopped out at the ranch last weekend to shoot part of an episode featuring Rye Whiskey... program host Kevin Brauch learned the basics of roping & branding from Flint Lucas.... he even landed in the Lucasia Ranchhouse kitchen where yours truly helped him cook up a batch of Prairie Oysters! 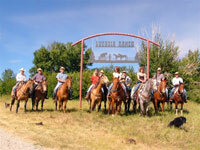 Much fun was had by the Lucasia Ranchhands as well as friends & neighbours who turned out for the day. 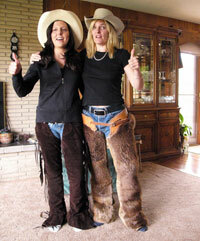 This particular episode of Thirsty Traveller will air in 2006 - check back for an exact date. I have been talking to some of my previous guests and am so pleased that they keep up with us by checking my news corral. 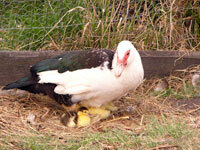 Of course this is the time of rebirth and all of our animals are having babies. We would also like to introduce to the newest member of our family. Rusty has a new baby... her name is Reba, and did I forget to mention-she has four legs. As of the 5th of May she is 10 weeks old and has won the hearts of everyone who meets her. We are also in the process of building a new log cabin for our guest so please check in next month and hopefully we will have something to show you. Spring has come to the Porcupine Hills and the first sign is the Bald eagles that soar over the pastures waiting for the gophers to pop out of their holes. 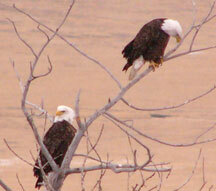 These majestic birds stop here for only a couple of weeks on their way north to their breeding grounds. But oh, what a sight while they are here. Lucasia has finally started calving, so the next couple of months will keep everyone checking cows, moving pairs (momas and babies) and finally on June 11, we celebrate the end of calving season with our branding and neighbourhood social. I still have room if anyone is interested in booking at that time. 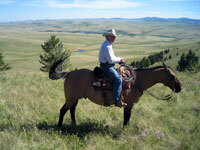 Keep checking the website as I now have a digital camera and can keep you informed of the goings on around the ranch. Also, Thank you to all of my guests who have sent me recipes. They are absoutely great! I know that they are top-notch as my weight will attest. And If you still have a recipe to send, please do so... I would be more that happy to have as many recipes as you would like to give me. The plan is within the next 2 or 3 years, to put together a book of guest recipes from all over the world. Sounds like fun eh.... I'll keep you posted on this project.